PPC Coatings Polymorphic Polymers’ unique physical properties are what make them so successful in highly corrosive conditions. PPC Coatings are impervious to a wide range of corrosive chemicals that attack concrete, including Hydrogen Sulphide (H2S) which is generated in waste water, and Sulphuric Acid (H2SO4) which is formed by hydrogen sulphide gas condensing on an aerated, wet concrete surface. 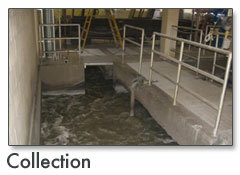 The success of PPC Coatings protecting the waste water treatment infrastructure is a combination of the highly modified Polymorphic Polymer Resin, together with a simple application system, creating a non permeable protective coating that overcomes the common problems that cause coatings to fail when applied in a waste water environment. 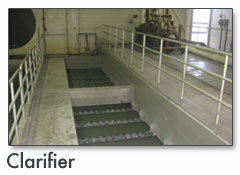 PPC Coatings Waste Water System can be applied on new or old concrete. PPC is a rapid curing system that can be applied year round from temperatures ranging from minus 40°F to 160°F without the need for external heat assistance. A substrate applied with PPC can be returned to full service within an hour, saving on costly “down time” expenses. Costly work delays, and inconveniences caused by lengthy shut downs are avoided as PPC Coatings have no application window limitations. A common reason for coating failure in waste water applications is blistering, caused by moisture build up between the coating and the substrate, and out gassing caused by a temperature increase in the substrate during the curing stage. PPC is a thermoset resin. The curing process of PPC is created by the buildup of heat - hardening and curing the resin rapidly. The short curing process does not give time for moisture to build up on the substrate, eliminating this common cause of blistering in most coating systems. The rapid thermoset cure, which is not effected by heat increase on the substrate, together with the unique anti-pinhole formula properties of PPC, minimizes the possibility of pinholes and holidays. Thermal shock and thermal expansion in concrete causes coatings to crack and delaminate. PPC Coatings have a coefficient of thermal expansion similar to that of concrete. This physical characteristic makes PPC coatings highly resistant to thermal shock and thermal expansion and hence suitable for applications where extreme climate change is a factor. PPC is U.V. stable and resists chalking in outdoor exposed applications. PPC will protect against a wide range of compounds, including alkali, acids, salt, ozone, and chlorine that may be found in waste water environments. The PPC Coating Waste Water System for new or rehabilitated concrete is simple, minimizing application errors which are a common cause for coating failure. 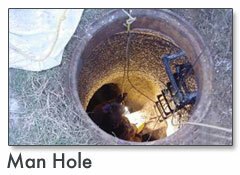 PPC can be applied by brush, roller, trowel, or by spraying. 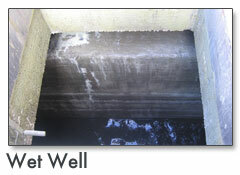 The PPC Coating Waste Water System is typically a three layer system: Prime Coat, Intermediate Coat, and Final Coat. Bug holes, honeycombs, joints, or damaged concrete areas are easily filled with PPC mortar, made from the same Polymorphic Resin. This eliminates the need to specify a combination of products in the application system that must be compatible, and avoids stalling the application process due to a prolonged cure time. If the substrate requires a lining coat to create a smooth built up surface, PPC mortar can achieve this with the same chemical and physical properties and rapid curing typical of all PPC coatings. All PPC coating systems are made from the same Polymorphic Polymer resin, and cure in the same manner. Polymorphic Polymer resin is what creates the physical properties that protect against the corrosive environment, not the buildup of filler materials, eliminating the need for larger quantities of coating to protect the substrate. These combined characteristics make PPC a practical and economical long lasting coating. 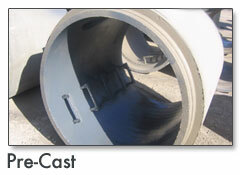 PPC Coatings are compatible with, and will bond to fiberglass pipes. PPC Coatings meet or are well below the maximum requirements for VOC emissions.